They're instantly recognizable and put on a show unlike any other. 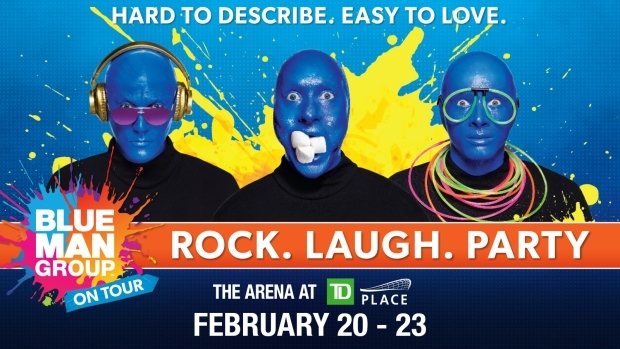 CTV Morning Live has your chance to win a family 4-pack of tickets to see the Blue Man Group at TD place next week. Their performances are euphoric celebrations of human connection through art, music, comedy and non-verbal communication! To enter, watch CTV Morning Live Monday-to-Friday to learn the "Blue Man Group Colour of the Day." E-mail the colour to pickme@ctv.ca for your chance to win! Details and tickets are available here! No purchase necessary. Contest starts at 6:00am E.T. on Monday February 11th and closes at 6:00pm E.T. on February 15th. Open to legal residents of Ontario, Canada who are of the age of majority in the province or territory in which they reside. Some restrictions apply. Correct answer to a mathematical skill testing question required. Approximate retail value of the prize is $100 CAD Odds of winning the prize will depend upon the total number of callers following the applicable announcement.